The Hamilton Avenue MTS is undergoing permit inspections and could be open by early 2017. A new plan to send Brooklyn’s garbage upstate would solidify the city’s waste export strategy for decades, but also shows how impractical the system has become. 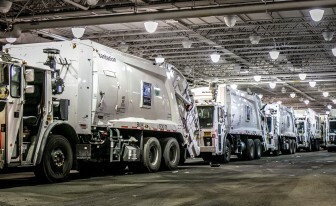 Under a newly proposed 20-year contract with IESI—a major industry player owned by Canadian company Progressive Waste Solutions—much of Brooklyn’s residential garbage would be shipped to the company’s Seneca Meadows landfill at a projected cost of $3.3 billion. New York has struggled to deal with its garbage in a sustainable way since the Fresh Kills landfill closed on Staten Island in 2001. According to Department of Sanitation (DSNY) data, it cost $99 to dispose of a ton of garbage in 2000 versus $145 in 2014 when adjusted for inflation. NEW YORK'S TRASH CHALLENGE: Read our series on the mounting obstacles to handling the city's waste. Much of the waste from central and southern Brooklyn is currently shipped out of the city from truck-based transfer stations—including two owned by IESI—or by rail. In an effort to reduce emissions, more barges will eventually handle waste at the city’s long-delayed marine transfer stations. The Hamilton Avenue MTS is undergoing permit inspections and could be open by early 2017. The Southwest Brooklyn MTS is still under construction. While IESI originally planned to send barges from the Brooklyn contract to New Jersey, shipments will now go to Staten Island’s Global Container Terminal instead. 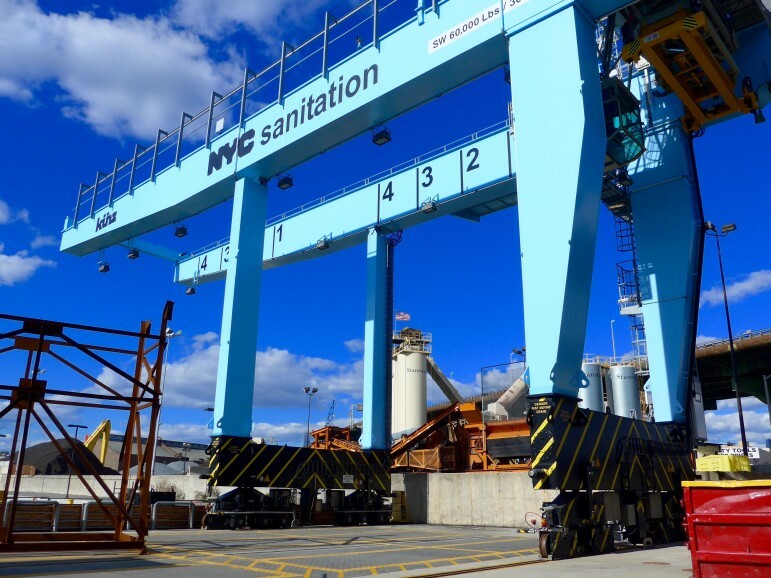 Once every marine transfer station is operational, the terminal will handle thousands of tons of garbage from Brooklyn, Manhattan and Queens each day. Borough President James Oddo sees this as an economic development opportunity rather than an environmental burden. Oddo does recognize the costs involved—which he believes limits funding for other city services—and says New Yorkers should reduce the amount of trash they send to other communities. DSNY’s export operations are projected to cost more than $367 million in Fiscal Year ’16 and will likely be higher once all marine transfer stations are open. Seneca Meadows already takes large amounts of Brooklyn’s waste by truck, but continuing this plan long-term presents multiple challenges. Railroad tracks don’t go directly to the Seneca Meadows landfill and a state judge ruled against the company’s attempt to rezone land for a necessary rail spur last year. 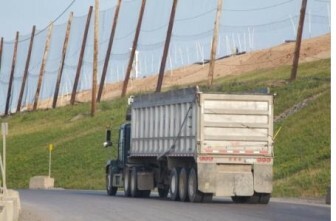 According to the state’s Department of Environmental Conservation, the landfill’s permit also expires in 2017 and it only has 7.5 years of capacity remaining if intake levels remain the same. IESI did not respond to multiple requests for comment. Despite attention upstate in the Finger Lakes region, local discussion of the plan has been limited. The attorney for Concerned Citizens of Seneca County, Douglas H. Zamelis, was one of only three people to testify at a contract hearing last month. The proposed 20-year contract could extend landfill use past the city’s target date of sending “zero waste” to landfills by 2030 until at least 2037. DSNY can end the deal early, with penalty levels for termination decreasing over time, or take the option of two five-year extensions. DSNY’s director of public affairs, Kathy Dawkins, says long-term stability is the city’s primary goal. DSNY hopes to have the contract registered by the city comptroller’s office within a few months. Though this deal would decrease New York’s dependence on out-of-state landfills, it merely shifts the burden within state lines. Until residents become more aware of what it costs to make their 3 million tons of waste go away each year they’ll have little incentive to reduce it. According to NYC’s Independent Budget Office (IBO), the East 91st Street MTS will triple the cost to dispose of the garbage that comes to it. It’s the one MTS that has been evaluated by the IBO, but we can expect all of the MTSs to raise NYC’s already astronomical waste management costs similarly and dramatically. The costly and outdated MTS plan was launched in the early 2000s and approved in 2007. The plan does ABSOLUTELY NOTHING to improve NYC’s dismal and lagging recycling rates – or to reduce the amount of waste the City produces. In fact, the 20+ year contracts the City has entered into with vendors to haul and landfill or burn waste in mostly poor, minority communities far, far away will act as a disincentive to implement programs to reduce or divert more garbage. NYC lags far behind other cities – with a 16% DSNY recycling rate compared to an average rate of 35% in U.S. cities. The MTS plan was pushed forward based on the idea that it would make waste management more equitable across the City and reduce burdens on truly overburdened neighborhoods. It will NOT accomplish those goals, but that fact has been lost in the shuffle. What NYC needs to do first, to begin to reduce the amount of waste we generate, is to implement a way for residents to know what they actually pay for waste management (now the costs are buried, unknowable & uncontrollable by residents) – and to implement garbage collection price incentives that encourage us to generate less waste. Clear rules and enforcement of price incentives are needed for both residents and businesses. DSNY also needs to make it much easier for residents to do the right thing: the City agency has been focused for far too long on obstacles to recycling and reduction programs – what can’t be done – and not nearly enough on bold, creative solutions. NYC needs a waste management revolution – and the MTSs will make it much harder to change the lagging and bloated status quo. I agree that “Pay as you Throw” (or other means to connect New Yorkers with economic costs of their wastes) represents potent solution. And we absolutely need to reduce waste. Changing culture is necessary, via outreach and education programs, esp with children. Do we know how much $$ is funded for outreach efforts by GreenNYC and GrowNYC OROE? Perhaps a big opportunity lies in understanding the extent of funding and effectiveness of these efforts. I suspect woefully underfunded and fear that it will take years for PAYT to become reality. Think of what we all will waste in the meantime! “Pay as you Throw” would be unmanageable in NYC. The city is too large. I pay $5k/year in property taxes + nyc income tax, etc. The city gets enough of my money as it it. Enough is enough. Manhattan and Queens each day. Manhattan and Queens. SI handles it’s own waste via the rail line over the AK Bridge.